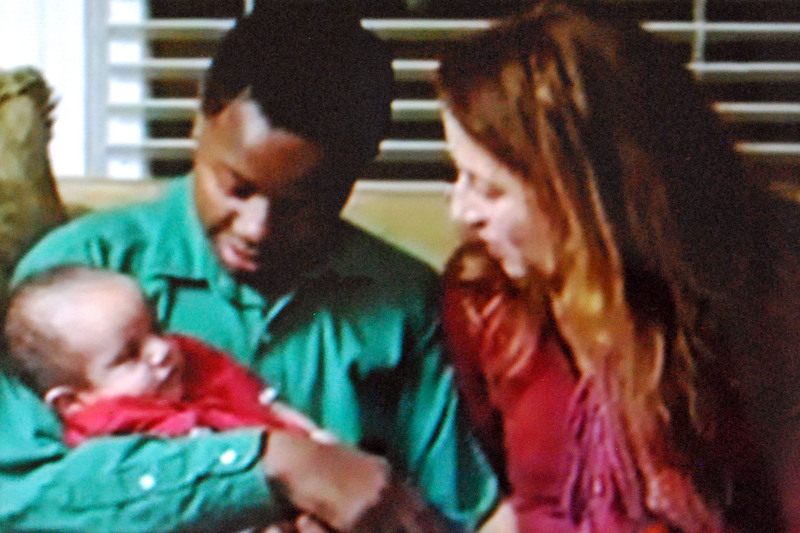 Born to Save, video still, my son and me with “Baby Jesus”, 2013. She stands alone on a dark sidewalk, snow falling. She stares, captivated by a scene framed in the window. A family gathers. She can see the love that binds them, as real and palpable as the wind that cuts through her old and torn clothing. She wonders if she will ever be home. She lingers on the outside, looking in. Jedd, my son, also stands on the outside, watching. A turkey adorns the center of the table, perfectly browned and crowned with oranges, star fruit, and kiwi – a bounty of color and exquisite scents. Sweet potatoes, stuffing, beans, mashed potatoes, salads, and cranberries crowd the star attraction, rimmed by green plates waiting to be laden. Warmth and laughter circle the table. A family, glimmering in holiday finery, bows to pray. Glaring at his brothers’ backs, emotion swells in Jedd’s heart like a black cloud, then thunders across his face. Our family of six gathered moments before with eight other extras and singer Stephanie Pauline for a music video shoot of her new Christmas song, Born to Save. At the table in the heart of the Victorian house, ten lavish place settings waited. With eight extras settled, the videographer requested two of our three boys to take the last two seats. But, how to choose? The group laughed awkwardly. Someone suggested that our daughter pick. The situation unfolded rapidly, and before my husband and I realized what was happening, Jedd was the brother not chosen. I watch helplessly as the scowl on Jedd’s face intensifies. Suddenly, I know this is about far more than the video shoot. This is that deep, old wound inflicted before conscious thought. This is the subconscious memory of a newborn baby, thrust into a world with no waiting arms to welcome him. This is the primal wound of the outsider, the forgotten, and abandoned. Amidst the bustle of filming and a crowded room, I can’t think of anything to do except pray. Finally, Jedd can stand it no longer and flees the room. I follow and slip my arm around his shoulders. Whispering, I acknowledge his hurt. But still I don’t know what to do except to tell Jesus that this whole situation is absolutely ridiculous! This is the exact opposite of what the whole project is about! The song and video, Born to Save, is all about the outsider being invited in. As the story unfolds, the homeless girl watching from the sidewalk will be welcomed in to join the family. This turn of events for Jedd is twisted and ludicrous; and I tell Jesus He simply has to fix it! The filming in the dining room wraps up, and at least we can now reach the kitchen on the other side to load a plate of food for Jedd. But he is still so sad. Then the videographer requests Jedd, my husband, and me to come to the living room to shoot a scene. We settle side-by-side, and the baby who represents Jesus is placed in my arms. In a moment of certain divine inspiration, the director asks me to place the baby in Jedd’s arms. The final video captures that magic moment. Jedd’s face lights up as he cradles the little bundle. Then and there, I know that the whole situation is far more than bad luck or nasty coincidence, far more than twisted irony. On a late October evening, at a music video shoot, Christmas arrives early. And that is the magic, the mystery of Christmas. A great, holy God bending near to earth, born in a manger because there was no room for him anywhere else. A God who willingly placed himself on the outside so we can be counted in. A God who sees and chooses the one young boy in a crowded video shoot who most needs to know that the lies inserted in his heart at birth are not his true identity. A God who welcomes the stranger, the outcast, the abandoned. A God who came for you and me. Bawling my eyes out. Thanks Colleen! Love you and Merry Christmas. So thankful we are walking this road together – miles apart but right together in heart. So tender and beautiful! I know so well of what you write. Love to you, friend. Indeed you do! I am thankful for your companionship on this journey. I love the story and the video! So glad Jedd got to be in it! I have had so many moments when all I can do is pray silently for one of my children. So glad He is always there. Yes, I thank God every day that He loves my children immeasurably more than even I do. Merry Christmas Teresa! I’m looking forward to catching up on all your beautiful Christmas posts in the next few days!